Kasco now offers three new choices of Beneficial Bacteria. Macro-Zyme �+ and Macro-Zyme � are designed for pond and watergarden applications. Macro-Zyme � Just Flush is designed for use in septic systems. These new Kasco products offer affordable, easy, and effective natural solutions to pond and septic system maintenance. 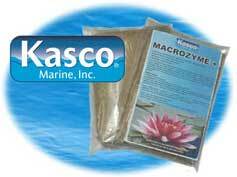 Macro-Zyme � is a totally unique blend and is the pond professionals choice for building and maintaining a healthy pond, water garden, and bio-filter. It is a blend of highly concentrated natural bacteria and enzymes that rapidly biodegrades sludge, improves water quality, decreases suspended particles and solids, removes Chlorine and Chloramines, and eliminates odor. It also reduces or eliminates Ammonia, Nitrite, Nitrate, and Phosphate. Once introduced Macro-Zyme � + quickly and effectively accumulates harmful organic material to the bottom of the pond where billions of beneficial bacteria work around the clock to neutralize and purify the water. Click here for more information.